Try Risk Free for 30-Days. We're so confident that you'll love our console & PC gaming desks we're offer you a 30-day risk free guarantee. If you don't like it, send it back. It's just that easy! Free shipping & Free return shipping if you're not satisfied. S-Series Gaming Desks - Our S-Series pc gaming desk setup comes with a carbon fiber texture desktop and Blue LED lights. The R1-S gaming desk comes with RGB LED lights in the desktop molding pieces and throughout the rock solid desk legs. Our S-series gaming tables come with a cup holder, headphone hook, cable management, controller stand, and mouse pad. E1 Racer Standing Gaming Desk - The Eureka E1 Racer is an adjustable standing desk with super smooth height adjustment. Carbon fiber texture desktop and hand painted aluminum trim pieces gives this gaming setup the look and feel of a high performance race car. The E1 ergonomic design and height adjustment will help with fatigue from sitting for long periods of time. The E1 PC gaming desk includes cable management and a mouse pad. The E1 Racer is the best gaming computer desk, period! i-Series Computer Gaming Desk - The i-Series gaming computer desk is the perfect combination of a home office desk and gaming desk at an affordable price. 3 models to choose from. 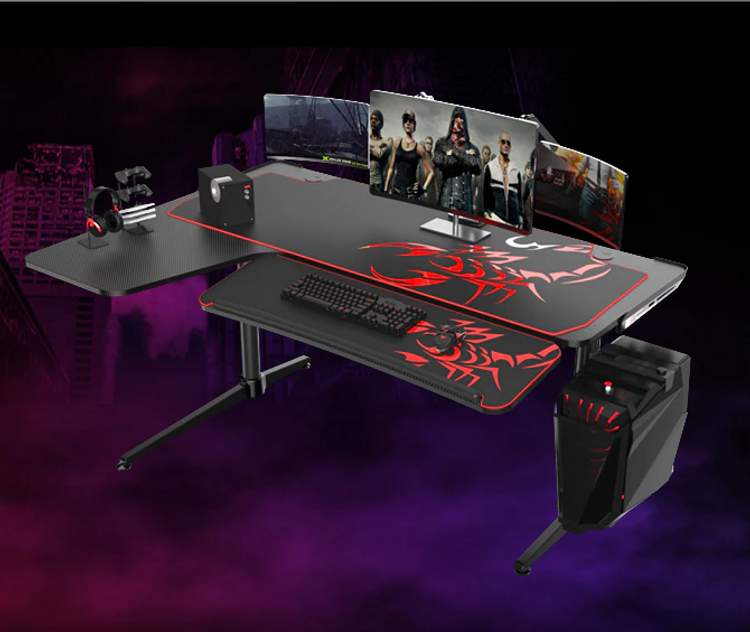 The compact i1 Gaming Computer Desk, the wide 60" i60 gaming desk, and the L60 L-shaped desk. The i-Series computer desks include cable management and a mouse pad. Stop gaming on your old boring desk and get in the game with the dynamic RGB LED lighting in the Eureka Z60, R1-S, and Z2 pc gaming setup. Watch your pc gaming desk come alive with built-in dynamic RGB lighting. Simply plug the USB cable into your gaming pc, gaming laptop, Xbox or PS4, and BOOM! You'll light up the room. Choose your favorite color or dynamic RGB multi-color light show. Experience your game like never before with the Eureka RGB gaming desk. Eureka pc gaming desks are pretty awesome by them self. But, when you add our gaming desk accessories to the Eureka gaming desk you now have the perfect battlestation to destroy your competition. Upgrade your Eureka gaming computer desk with our adjustable gaming keyboard tray, sidecar CPU rack, extra large gaming mouse pad, and gaming accessory pack to take your pc gaming desk to the next level! Your satisfaction is our top priority. We make sure we're only designing and manufacturing the best pc gaming desk on the market today. We hold our gaming setups to the highest standard and hope you have an excellent gaming experience using your Eureka gaming computer desk and gaming accessories. We're offering you a 30-Day Risk Free Guarantee. If you don't like it, just send it back. It's just that easy! Plus, free ground shipping* and free return shipping* if you're not satisfied. Here's some real reviews, by real shoppers about Eureka gaming desk setups.